Great Gifts for Horse and Travel Lovers! Finding a special gift for your family and friends can be hard. We're taking over some of the work for you this year! 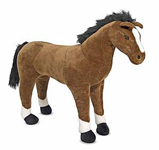 Our team at Equitrekking has compiled this special section of Equitrekking.com to help you find unique gifts for horse lovers this holiday season, including a special section with horse gift ideas for kids. 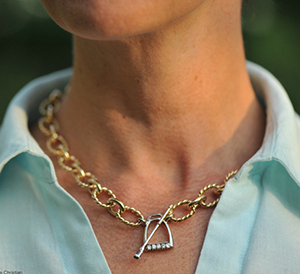 We picked Mark Lexton's Equestrian-Inspired Jewelry Collections as a top pick. 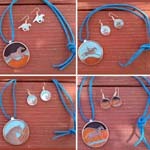 This hand carved equestrian and sporting life jewelry is made in the USA. We enjoy finding gifts with special meaning, and these beautiful pieces can be kepy for life. Happy shopping! If you haven't heard of Mark Lexton's equestrian-inspired jewelry collections, you are missing out! 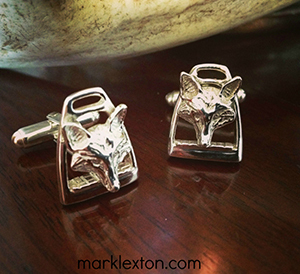 Originally an equestrian jewelry line for women, Mark Lexton has since added a few new products for horse-loving men. The story begins with a third- generation jeweler marrying a woman passionate about her horses, and you can guess how that ends! The Sterling Stirrup Pendant ($65), Hand Carved Crop Ring ($55) or Sterling Stirrup Earrings ($110) are great gift ideas for horse-loving moms, sisters, friends or as a special occassion keepsake for young riders. Equestrian men or men that you want to give some horsey flair can get dressed up for New Years in the Fox Mask and Stirrup Cufflinks and women who love the country life may like the Fox Mask with Stirrup Earrings. 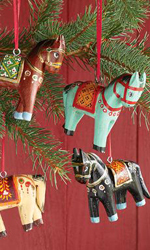 These colorful hand painted red, blue, yellow and black wooden folk horse ornaments caught our eye and may inspire you to get started on your tree trimming. They're from the popular Sundance Catalog founded in 1969 by Robert Redford, who we all know is a horse person! Set of 4. $68. Horse Ornaments. Over the river and through the woods to break bread and toast this holiday season with the most important people in your life. Set a tradition; create the look - only Quarter Horse Outfitters the official store of the American Quarter Horse Association. welcome guests to your home on the range. to flirty cowgirl bold. Get the look. Only at Quarter Horse Outfitters. Take your pick from these handmade horse themed chocolate collections. They're all delicious. Dark Horse Chocolates is by longtime New England chocolatier Harbor Sweets. 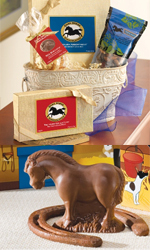 Gift choices include the Trophy Assortment, Trail Mix, Keepsake Box 'Mares and Foals', and Peanut Butter Pony. Starting at $6.95. Dark Horse Chocolates. Reveal your horse style with these colorful, equestrian inspired jewelry sets. Are you Wild & Free, the type of rider who'd Jump for Joy, a stunning and enduring Arabian or expressing your nurturing side with the Mare & Foal. Another great pick from the gals at Long Riders Gear, experienced trail riders. $37.95. Desert Horse Jewelry. From vintage horse head brooches to Art Nouveau style antique inkwells, The Old Grey Mare shop owned by Dexter Grass specializes in unusual canine and equine antiques. Dexter is a lifelong horsewoman, who lives outside of Houston on a farm with over 80 horses! We've been Twitter friends with Dexter for quite some time. This is a fun shop to visit. Prices range from $30-$250. The Old Grey Mare. Fall into western chic with the hottest trends from Quarter Horse Outfitters. $44.00 from Quarter Horse Outfitters, Cowgirl Top. A few of you have emailed us about where to find this waxed jacket that is popular among the riding set. Drum roll please... It's now available at J Crew. Again, this might be an item you buy for yourself or hint to a loved one that they should buy it for you. We know from experience that the handwarmer pockets in this jacket come in handy on the trails - at least in Ireland! Take your riding photos to a whole new level! Triple Crown Studio specializes in capturing the relationship between horse and rider and transforming photographs into museum quality digitally mastered Fine Art Plaques. This is a special personalized gift that we recently ordered ourselves. An unbelievable value at $195 from Triple Crown Studio. 30% of the purchase price will be donated to Canter, a wonderful organization that helps rehab horses. Our friends sent us this as a gift last year and we've used it a lot! 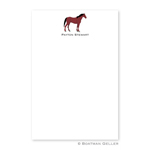 These horse branded notepads from Boatman Geller can be personalized with your name. These cute horse notes are useful in packages or for messages to friends. Size: 6.375 x 4.25. Each package contains one 75 sheet padded notepad. Starts at $9. Horse Notes. Know someone who's always dreamed of riding in Ireland, Spain, Wyoming or Hawaii? Inspired by the Emmy-winning Equitrekking travel TV show on PBS, Equitrekking Travel features exceptional horse riding vacations. Order a gift certificate in any amount over $25 towards a future riding vacation. Contact us to order. OK, so can you tell we like personalized items? 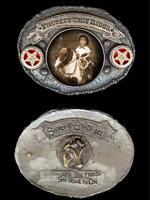 You can customize this "Protect This Rider" buckle with your own photos. Designed to complement funky Sweetbird Studio's series of "Protect This Rider" pendants, each buckle is accented with two red five point stars, and a signature hand-cut banner. We're always up for a good horse documentary or film and this one recently won the U.S. Documentary Audience Award at the Sundance Film Festival and is getting great buzz. It follows Buck Brannaman from his abusive childhood through his journey to a life with horses. $9.99. Learn more about Buck . The exercises in Zen Mind, Zen Horse: The Science and Spirituality of Working with Horses offer a new understanding of how humans train and interact with horses and why these two species have such a deep, natural connection. Our staff found this read eye-opening. Found on Amazon.com. $16.47. 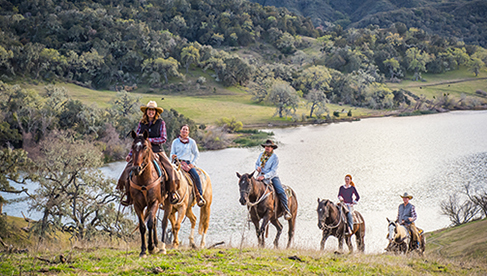 Escape to great U.S. ranches. Ride through Ireland, Hawaii, Iceland and Spain. Learn about exotic, farl flung cultures and cowboys close to home. Emmy-winning Equitrekking DVD's made Matador Network's "The Ultimate Guide: 100 Gift Ideas for Travelers." Special Holiday Promotion. Buy any two DVD set's and receive a complimentary Equitrekking branded T-Shirt. Each Equitrekking DVD set $29.95. Like our TV show? Check out our companion book, featuring more history, culture and travel information and stunning photos from the dreamy places we've trekked. 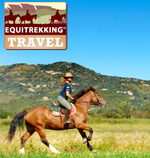 Equitrekking: Travel Adventures on Horseback Starting at $11.00. Limited supplies. An Equitrekking staff pick, the peppermint herbal blend helps fight off bacteria and fungus, while leaving your horse smelling fresh and minty. Formulated with quality ingredients, we picked a bulk quantity, because we know you like to share. $20. 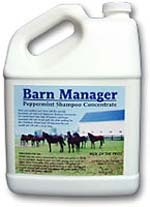 Peppermint Shampoo. These horse treats are made from Certified Organic ingredients, baked and shipped fresh from Winnie's Cookies. The best part is that your horse can test them out. Winnie's offers a generous sample of 6 (large) Winnies Cookies sent to you for nominal shipping and handling charge of only $3.45. Starting $13.95 for a Snak Pak - 2 Dozen. Winnie's Cookies. Give your horse the gift of the best possible care with equine insurance. It's hard to suddenly come up with the money if your horse gets sick or injured, but you can secure your horse's wellbeing with a mortality/major medical insurance policy and ensure they get the care they deserve. If your horse gets sick or injured, we pay the vet. If your horse dies, we pay you. It's that simple. Middletown, RI 02842 We could have used one of these when filming in the Quebec show! The Techniche® ThermaFur™ IonGear™ Battery Powered Heating Vest can be used to combat the cold across a wide range of occupational and recreational activities. The Temperature Controller has 5 settings, 86 degrees, 104 degrees, 122 degrees, 140 degrees, and 158 degrees allowing you to select the temperature just right for you. TechNiche International has recently introduced their new line of heating products to the Equestrian market. Sold at Equestrian Collections for $164.99. Techniche IonGear Battery Powered Heating Vest. In a dim stable or preparing to ride the trails at sunrise, this new gadget from MJ Equine Tools is helpful. Designed by equine enthusiasts Maralee Glunz and Joanne Stoynofft, this hoof pick touts a high powered LED light, an easy to grip handle and heavy duty stainless steel pick. $24.99. Illuminated hoof pick. We carried this backpack with us on safari in Africa and it held up well. 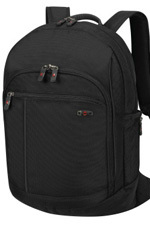 Made by Victorinox, it holds a lot and the padded back panel makes it comfortable to carry and protects important gear, like laptops. Added benefits: moisture-wicking mesh and patented, zip-away water bottle pocket. $129.99. Victorinox backpack. Anyone who trail rides, camps or travels will find these handy. Fit it in your pocket or saddle bag. It's only the size of a nickel, but once you add water, it grows to a towel 8 1/2 inches by 9 1/2 inches. A great item to add to your travel kit from Long Riders Gear. $9.95. 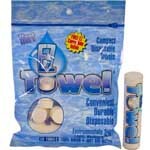 EZ Towel. The Club Equitrekking gift set includes the Equitrekking DVD Sampler, an Equitrekking Branded T-Shirt, $50 off the next Equitrekking Travel vacation that you book within a year of signing up for Club Equitrekking, a free 12-issue subscription to either Practical Horseman, Horse & Rider, Dressage Today or Equus magazine and more. 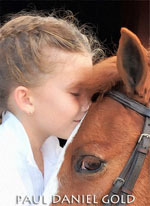 Kids Gift Tip: One of the best gifts is spending time with horses! Consider taking your horse loving child, niece, nephew or family out to a local stable to hang out around horses, schedule a day of trail riding or send a gift certificate for a riding outing. It's a gift that creates memories! 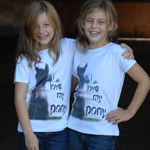 For your nieces, horse loving daughter or friends, these "I Love My Pony" tees from Wild Horsefeathers are fun! 100% cotton and available in youth sizes 8, 10 and 12. $20. I Love My Pony Tee. A colorful groomer / massager for kids makes them want to learn responsible grooming while soothing and prepping their equine friend. Sparkled heart nestles neatly, even into small hands. On sale for $5.60. Heart 2 Heart Curry Groomer. Horseplay is lots more fun when you have a realistic horse ready to play! 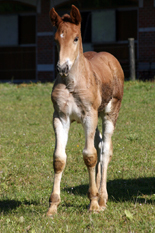 Almost four feet tall, this gentle brown pony has a blaze on its forehead and four white stockings. Attention to detail and excellent quality construction make this pony stand out from the herd! Measures: 43" x 35" x 12". Recommended Ages: 3+ From Quarter Horse Outfitters. $99.95. Kid-sized stuffed pony. 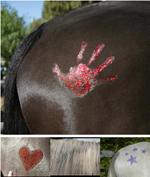 Kids and adults enjoy adding some sparkle to their horses. Many folks use this bit of pizazz in parades, games, or to spice up time on the trails! Made by Tail Tamer Products. $9.99. 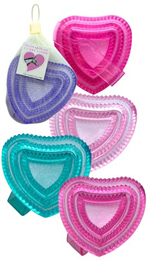 Sparkle Mane Tail and Body Gels. Kids Gift Tip: Do a little recon work before selecting a kids horse gift. If possible, find out their favorite horse breed, riding style or that item that they really need or want. Your local stable or tack store may be a good source for practical ideas. Every kid that dreams of owning a horse will love owning Breyer tack for their model horse - miniture bridals, saddles, blankets, wraps, halters, lead ropes and more. bell boots and fly bonnet. : $19.99. English Riding Accessory Set. We're not leaving out the boys! We shopped at the Cowgirl Shop, the official gift shop of the National Cowgirl Museum and Hall of Fame, while in Fort Worth. 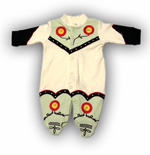 They have some great stuff, including this cute Western ensemble for boys. Age 6 to 9 months. $39.50. Boys Western Onesies. Misty of Chincoteague and all of Marguerite Henry's stories are considered classic horse stories by many. This box set sold on Amazon.com includes Misty of Chincoteague, Justin Morgan Had a Horse and King of the Wind. $12.23. Marguerite Henry Treasury of Horses We've never seen anything like this. It's a fun item for little girls who may be headed to slumber parties or just want to lounge around over the holidays. Horseshoes and cowgirl boots decorate the plush, synthetic fur covering. Includes a cuddly, detachable palomino pony as the pillow. 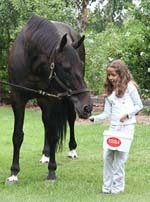 From NetEquestrian.com for toddlers and small children ages 3-8. $73.95. 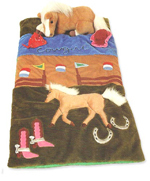 Cowgirl Horse Sleeping Bag. 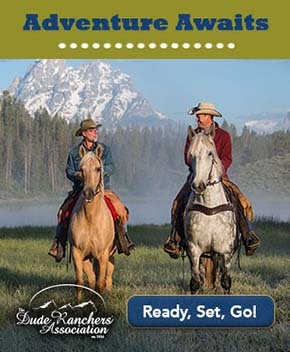 Shop also for equestrian vacations, dude ranches and cattle drives for a dreamy horse experience in the Equitrekking.com Vacation Guide and at Top20Ranches.com. To learn more about the gift guide, suggest items and Equitrekking on TV, contact us.